1st cousin to Joseph Smith, Jr.
With Willard Richards, kept the saints from retaliating after Joseph Smith was murdered. They called Willard and George "two fat men for patience." George Albert Smith (June 26, 1817 – September 1, 1875) (commonly known as George A. Smith to distinguish him from his grandson of the same name) was an early leader in the Latter Day Saint movement and served in the Quorum of the Twelve Apostles and as a member of the church's First Presidency. Smith was born in Potsdam, St. Lawrence County, New York, the son of John Smith and Clarissa Lyman, and a nephew of Joseph Smith, Sr. In September 1832 at the age of fifteen, George A. Smith was baptized into the new Church founded by his cousin Joseph Smith, Jr. The following year, John Smith and his family moved to Kirtland, Ohio, the headquarters of the Church. There Smith met his cousin, Joseph Smith, Jr. for the first time. In 1838, he moved with his parents and a large body of church members to the state of Missouri. In the spring of 1834, the sixteen-year-old George A. Smith accompanied a group Latter Day Saints on a 2000 mile march to Missouri and back to Ohio. This trip, known as Zion's Camp, was intended to bring aid to suffering members of the church in Missouri. He served as a missionary to the eastern states, traveling and preaching during the summers of 1835, 1836, and 1837, while attending school during each winter. Smith was ordained a Seventy in the priesthood on March 1, 1835 by Joseph Smith, Jr. On April 26, 1839, at the age of 21, George A. Smith was ordained an Apostle and he became a member of the Quorum of the Twelve Apostles of the Church. Future President of the Church Wilford Woodruff was also ordained as an apostle on the same day. The two men replaced former Apostles Thomas B. Marsh, who had apostatized, and Orson Hyde, who had been disfellowshipped and removed from his position. After Joseph Smith, Jr.'s death and the relocation of the LDS Church to Utah, Smith led a company of 118 volunteers and about 30 families to establish a colony near the Little Salt Lake in Iron County. They arrived at Centre Creek, 265 miles from Salt Lake City, on January 13, 1851. 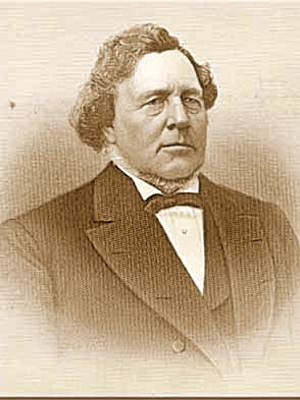 Under direction from the General Assembly of Deseret, the group organized the political entity of Iron County and elected Smith as chief justice. During the winter of 1850-51, the settlers constructed a fort enclosing homes, a meeting house to serve for meetings, a school, and a watch tower. They named their community Parowan. Smith taught school during the first winter. He later served as a member of Utah's territorial legislature. 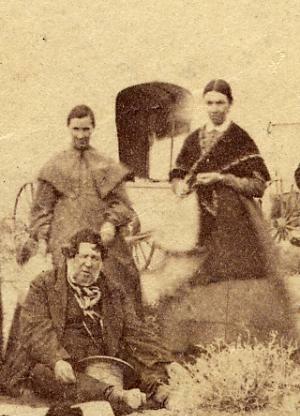 Smith was the eighth official Church Historian of the LDS Church between 1854 and 1871. 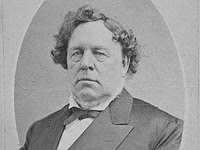 During the hurried series of actions Brigham Young and LDS Church leaders initiated on learning of the eminent arrival of U.S. troops into Utah Territory, Smith left Salt Lake City to visit southern Utah communities. Scholars have asserted that Smith's tour, speeches, and personal actions contributed to the fear and tension in these communities, and influenced the decision to attack and destroy the Baker-Fancher emigrant train near Mountain Meadows, Utah. This event was later known as the Mountain Meadows massacre. Leavingon August 3, 1857, Smith arrived at Parowan on August 8, 1857, and on August 15, 1857, he set off on a tour of the local military district manned by the Utah militia known as the Nauvoo Legion, led by Stake President-Colonel W. H. Dame. 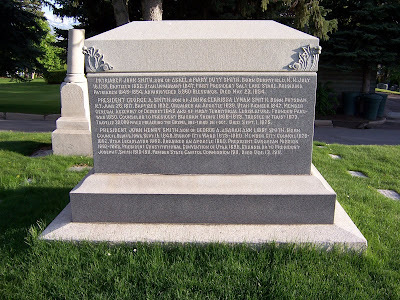 Although Smith's rank in the Legion was simply a private (see George A. Smith [July 4, 1852], JD 1:79; Smith 1875), one Parowan resident understood that part of the purpose of Apostle Smith's trip was represent the church leadership and to organize the regiment, inspect the troops, and provide instructions (see Martineau 1857). During the tour, Smith gave military speeches and counseled Mormons that they should prepare to "...touch fire to their homes, and hide themselves in the mountains, and to defend their country to the very last extremity." Smith instructed church members to stockpile grain, and not to sell it to emigrants or use it for animal feed. In addition to Parowan, Smith's tour included visits to Cedar City and Santa Clara. The group stopped at Mountain Meadows to eat dinner on August 20 (see Martineau 1857) with a group of resident missionaries(see Smith 1857, p. 222). Smith addressed a group of Indians in Santa Clara, counseling them that "the Americans" were approaching with a large army, and were a threat to the Indians as well as the Mormons. Riding in a wagon afterwards, John D. Lee said he warned Smith that the Indians would likely attack emigrant trains, and that Mormons were anxious to avenge the blood of the prophets, and according to Lee, Smith seemed pleased, and said "he had had a long talk with Major Haight on the same subject". Isaac C. Haight, LDS stake president of Cedar City, and second in military command under Dame, met with Smith again on August 21. Haight told Smith he had heard reports that 600 troops were already approaching Cedar City from the East, and that if the rumors were true, Haight would have to act without waiting for instructions from Salt Lake City. Smith agreed, and "admired his grit". Smith later said he was uncomfortable, perhaps "on account of my extreme timidity", because some of the militia members were eager that "their enemies might come and give them a chance to fight and take vengeance for the cruelties that had been inflicted upon us in the States", such as the Haun's Mill massacre where 18 Mormons were killed in 1838 in a skirmish with the Missouri Militia during the Mormon War . On August 25, 1857, Smith's group camped next to the Fancher-Baker party, headed the opposite direction, at Corn Creek (now Kanosh). Smith later said he had no knowledge of the Baker-Fancher party prior to meeting them on the trail. When the Baker-Fancher party inquired about places to stop for water and grazing, Hamblin directed them to Mountain Meadows, near the "Indian farm" there, a regular stopover on the Old Spanish Trail. Monument to four generations of a branch of the Smith family, prominent in LDS history. 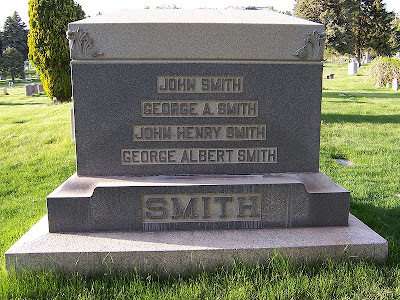 Grave marker of George A. Smith.Like many Mormon leaders in the nineteenth century, George A. Smith practiced plural marriage. In addition to his first wife Bathsheba, Smith married Lucy Smith, Nancy Clement, Sarah Ann Libby, Hannah Maria Libby,and Susan E. West. His wives bore him twenty children, eleven of whom were still living when Smith died. Smith was a portly man, at 5 feet 10 inches (1.78 m) and at least 250 pounds (110 kg). He was humorously known for sometimes removing his wig to wipe his brow while preaching. After seeing him remove his hair, glasses, and false teeth, Paiutes gave him the name Non-choko-wicher, or "takes himself apart". ^ The Quorum of the Twelve Apostles had not had twelve members since 1837-09-03, when Luke S. Johnson, John F. Boynton, and Lyman E. Johnson were disfellowshipped and removed from the Quorum. Since that time, William E. M'Lellin and Thomas B. Marsh had been excommunicated and removed from the Quorum; David W. Patten had been killed; and John Taylor and John E. Page had been added to the Quorum. The ordinations of Smith and Wilford Woodruff brought membership in the Quorum of the Twelve to ten members. ^ No apostle was immediately called to replace Smith. 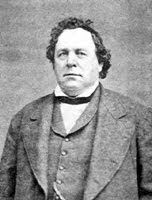 Brigham Young died two years after Smith, and the First Presidency dissolved. Due to the dissolution of the First Presidency, the Quorum of the Twelve had twelve members after Young's death and there was therefore no immediate need to call an apostle to replace Smith. ^ (Lee 1877, pp. 223). ^ (Lee 1877, pp. 223–225). ^ (Lee 1877, pp. 224). ^ Smith 1857, p. 223. ^ these chiefs included Ammon, Kanosh, Tutsegabit, and Youngwids (Brooks 1950, p. 27; Bagley 2002, p. 113). ^ Walker, Ronald W.; Richard E. Turley, Jr.; Glen M. Leonard (2008). Massacre at Mountain Meadows. Oxford University Press. p. 51. http://books.google.com/books?id=J1jPqCuF5TgC&lpg=PP1&pg=PA51. Retrieved 2009-08-17. Nibley, Preston. The Presidents of the Church. Deseret Book, Salt Lake City, Utah, 1974. ISBN 0-87747-414-1.